Kartik Aaryan, Ananya Panday, Bhumi Pednekar's Pati Patni Aur Woh Gets A Release Date! Kartik Aaryan, Ananya Panday, Bhumi Pednekar’s Pati Patni Aur Woh Gets A Release Date! 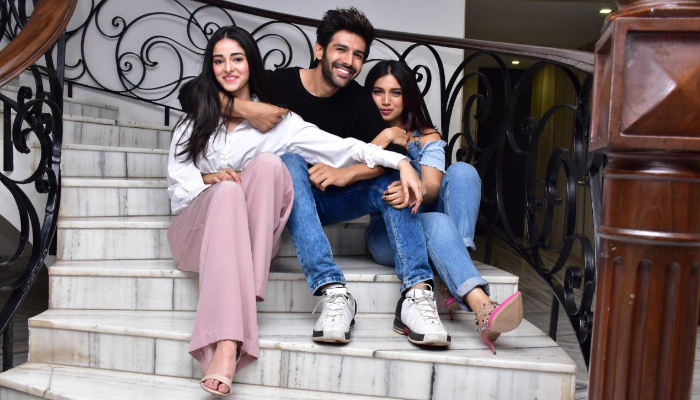 Kartik Aaryan, Ananya Panday and Bhumi Pednekar’s upcoming film, a remake of 1978’s drama, ‘Pati Patni Aur Woh’, will be entertaining us early this year. The much talked about film will be releasing on 6th December 2019. A modern redux of B.R. Chopra’s film will see Kartik reprising the role of Sanjeev Kumar in the film. T-Series and BR Studios, recently shared that they will be coming together for a multiple film deal. Their first association is ‘Pati Patni Aur Woh’. The original version received a warm response from the audience back then and the makers think that it still will be relevant to today’s audience. Directed by Mudassar Aziz, ‘Pati Patni Aur Woh’ is produced by Bhushan Kumar, Juno Chopra, Krishan Kumar, Produced under the banners T-Series and B R Studios. The makers have given a modern touch to the film which will maximise the reach amongst the audience. The vision will still remain the same and the story will have a nostalgic touch to it. It’s also been said that the movie will pack some playlist-topping songs and will be a treat to all the music lovers.